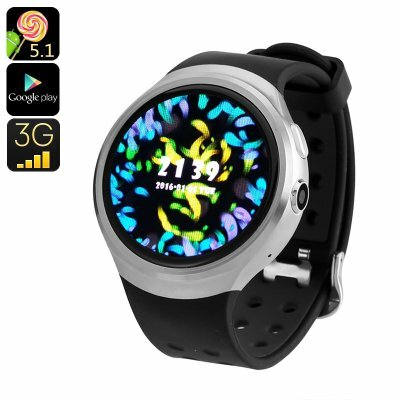 Successfully Added Z10 Android Watch Phone - GPS, Android 5.1, Quad Core CPU, Google Play, OK Google, 3G SIM, Bluetooth (Silver) to your Shopping Cart. The Z10 smart watch is a beautifully crafted timepiece sporting a classic circular face that has been designed to impress. A 1.39-inch touch screen is with 400x400 resolutions is easy to read from any angle and there are a number of clock faces with which to impress your friends. Alternatively, you add your very own and customize this smart watch to your own tastes. This feature rich watch with 3G SIM card support doubles as a smartphone as well as being your personal trainer and assistant. As it runs Android 5.1 you'll also get access to the OK Google assistant so can get directions for your next run, find the nearest gym or coffee shop and even set reminders all done with simple voice commands. A great way to organize when on the go and lets you multitask with ease making the most of your precious time. With its quad-core CPU and 1GB RAM, this Android smart watch can keep pace with even the most demanding users. There is a sedentary reminder, heart rate monitor and pedometer all built in to ensure you are getting enough exercise and let you keep track of activities. Being able to take and place calls from your wrist means you're not restricted by your Smartphone which you can leave at home and not be weighed down when you want to travel light. When paired with your Android or iOS device you can receive notification alerts, take calls and even listen to music. The smart phone watch will also work as a photographer and can be sued as a remote camera trigger for your Smartphone. Now you can snap those impressive selfies with ease. The Z10 Android smart watch phone comes with 12 months warranty, brought to you by the leader in electronic devices as well as wholesale smart watches and watch phones..